Asp.Net Core users don&apos;t have to use Visual Studio, but we&apos;ll use Visual Studio in this guide as we think most of our users will. Your solution contains Serene1.Web project, which is an ASP.NET MVC (or ASP.NET Core) application. It includes server side code written in C# (.cs) and client side code that is written in TypeScript (.ts). 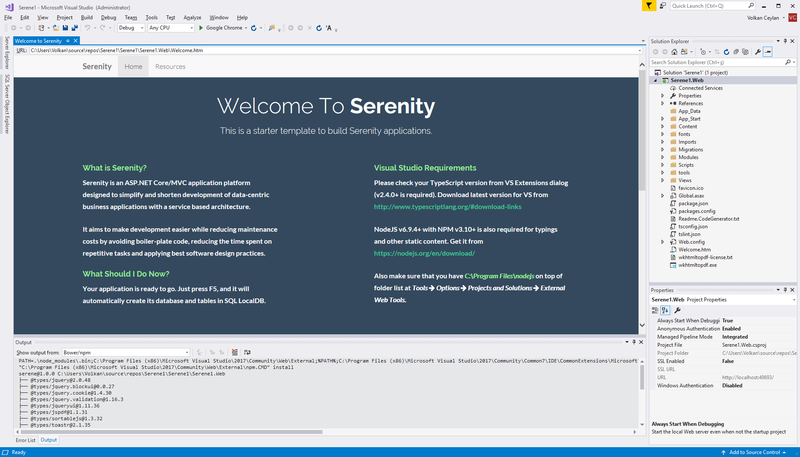 Serene.Web has references to Serenity NuGet packages, so you can update it using package manager console anytime necessary. Asp.Net Core version can also be updated by hand editing .CSPROJ file. Serene automatically creates its database in SQL local db at first run, so just press F5 and you are ready to go. 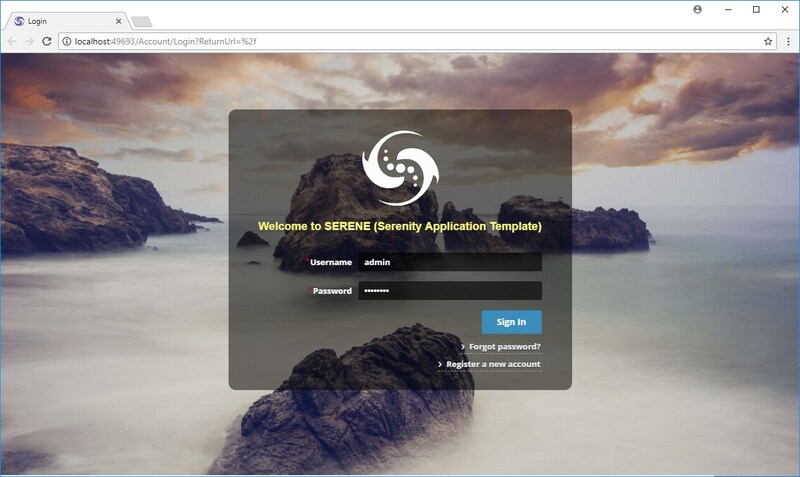 When application launches use admin user and serenity password to login. You can change password or create more users later, using Administration / User Management page. The sample application includes old and famous Northwind data along with services and user interface to edit it, which is mostly produced by Serenity Code Generator. > while establishing a connection to SQL Server. > The server was not found or was not accessible. This error might mean that you don&apos;t have SQL Server Local DB 2012 installed. This server comes preinstalled with Visual Studio 2012 and 2013. (localdb)\v11.0 corresponds to default SQL Server 2012 LocalDB instance, while (localdb)\MsSqlLocalDB is an instance of SQL 2014+ LocalDB. Visual Studio 2015 comes with SQL Server 2014 LocalDB. It&apos;s default instance name is renamed to MsSqlLocalDB by default. Thus, if you have VS2015, try changing connection strings from (localdb)\v11.0 to (localdb)\MsSqlLocalDB. You can also use another SQL server. Just change the connection string. Perform these steps for both Default and Northwind databases.